How big should the Atlantic Yards project be (or, for that matter, any project over the railyards)? If you compare AY to other major developments around the city, it would include more than twice as many apartments per acre than at Stuyvesant Town and Battery Park City, and thus a much more dense population--one that would surpass the turn-of-the-century Lower East Side. As of now, the 16 towers and arena would encompass 8.66 million square feet, according to the Final Scope. This represents about a 5 percent scaleback from the version described last year, but still about a 6 percent increase from the plan that was announced in December 2003. Another way to look at density is zoning. Forest City Ratner executive Jim Stuckey likes to say that taller buildings were approved in the Downtown Brooklyn rezoning, even though this project would not be located in Downtown Brooklyn (despite Forest City Ratner's effort to claim it so), and that no rezoning has been approved for this project. 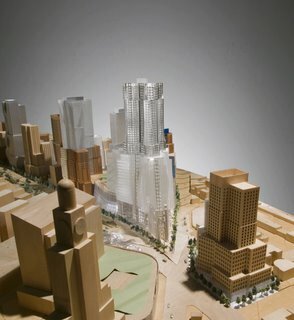 of the total site area, less than 10% (850,000 gross square feet) is to be devoted to the Nets professional basketball team arena; 7.2 million gross square feet is to be occupied by 7,300 residential units; approximately 1 million gross square feet is to be devoted to commercial, retail and hotel uses. In short, the Project Description envisions a virtual new city within the confines of the 22-acre site. This correlates to a density of 500,000 people per square mile, seven times the density of the population of Manhattan. Brennan continued by calling for consideration of proposals to reduce the scale and density of the project by 50% or more--an even greater cut than the reduction he recently proposed. Given the recent 5 percent scaleback, Brennan's numbers would change slightly. Still, the proposed density remains striking. Currently, 6860 apartments are planned for the Atlantic Yards project. At a conservative figure of 2.5 people per apartment, the project would house 17,150 residents, or nearly 780 people per acre. There are 640 acres per square mile, so that would represent about 499,000 people per square mile. Would Atlantic Yards be more dense than other major developments? Yes, especially in terms of apartments per acre. 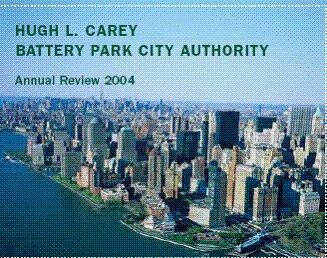 By way of comparison, Battery Park City includes 9000 apartments over 92 acres, going up to 14,000 apartments at full buildout.Peter Cooper Village and Stuyvesant Town is comprised of 11,250 apartments spread among 110 buildings over 80 acres. In the Bronx, Co-op City (right) contains 15,372 units in 35 high-rise buildings and 7 townhouse clusters, over 300 acres. 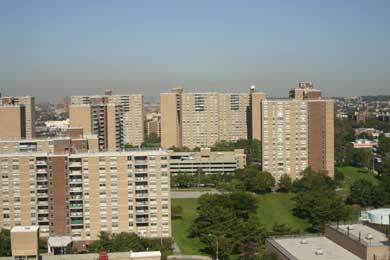 In Brooklyn, Spring Creek, also known as Starrett at Spring Creek, contains 5881 apartments over 153 acres. In Queens, Lefrak City has 5000 apartments over 40 acres. Note that these comparisons are preliminary and inexact--a starting point for discussion rather than a conclusion. I'm using an average of 2.5 people per apartment at Atlantic Yards, though the population per apartment at some other sites is higher. (And the population at Atlantic Yards could be even higher.) On the other hand, Atlantic Yards would have a larger percentage of non-residential space; all these complexes include retail, but Battery Park City is the only other one, I believe, that includes an office component. There's a case that any project built near Brooklyn's transit hub could be more dense than those built elsewhere. On the other hand, Battery Park City contains a network of streets; the master plan designates 19 percent of the site as streets and avenues. There was a distinct effort to avoid creating superblocks. With the Atlantic Yards project, it's unclear whether any streets are included as part of the 22-acre site. Moreover, the demapping of Pacific Street at the east end of the project, and of Pacific Street and Fifth Avenue at the west end would create superblocks. Note how the Atlantic Yards plan has evolved. As the projected population has grown significantly, thanks to a shift of office space to residential space, the residential density has grown significantly, much more than the square footage. I've also included the Extell plan for building just over the railyards, which is also quite dense, compared to other projects. And because the apartment sizes are larger in the Extell plan, it could create a larger population per apartment than in the Atlantic Yards plan; on the other hand, the Extell proposal would not involve an arena and the taking of city streets. I also tried to calculate the density of the Atlantic Yards plan without the arena. This is somewhat arbitrary, since it's not clear exactly how much the four buildings around the arena would overlap the arena footprint. But subtracting two acres for the arena (though not subtracting the hotel/office/retail space), the number of apartments per acre would grow even more. What would the density be under the cuts Brennan and Cohn have proposed? Take the Brennan plan, at 5.85 million square feet, and subtract 850,000 square feet for the arena, leaving 5 million square feet for housing, offices, hotel, retail. Assume a 20 percent cut in office, retail, and hotel space. (Office space would go from 606,000 to 484,800 square feet, retail space from 247,000 to 197,600 square feet, and hotel space from 165,000 to 132,000 square feet, for a total of 814,400 square feet.) That would leave 4,185,600 square feet for housing, or 4186 apartments. Cohn's suggested cut would leave the project at 5 million square feet. Subtracting 850,000 square feet for the arena and 814,400 square feet for office/retail/hotel space, that would leave 3,335,600 square feet for housing, or 3336 units. The ratio of 151.6 units per acre would be close to that of Battery Park City after its full buildout. However, if you subtracted two acres for the arena and considered the project over 20 acres, the density would go up. All these numbers deserve further discussion and debate, especially since the size of the apartments at these projects helps determine the total population. 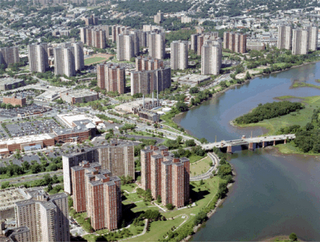 (At right, Spring Creek, formerly Starrett City.) But consider this. State standards call for 2.5 acres of open space for every 1,000 residents, which is an ideal infrequently met, while the city average is 1.5 acre per 1,000 residents. The projected 17,150 new residents at the Atlantic Yards project, to meet the state standard, would deserve nearly 43 acres of open space. To meet the city average, they'd need nearly 26 acres of open space. The current plan would include seven acres of "publicly accessible open space that everyone can enjoy," according to the Atlantic Yards web site. Given the enormous potential population and the relatively limited amount of open space planned, would that space more likely serve Brooklyn or be overwhelmed by the immediate residents? Even at the scaledown example with 3336 apartments, the open space would be too little. Multiply the number of apartments by 2.5 people (again, a conservative example), and that's 8340 people. State standards would require nearly 21 acres of open space. To meet the city average, they'd need 12.5 acres. Again, the project would include seven acres of open space.